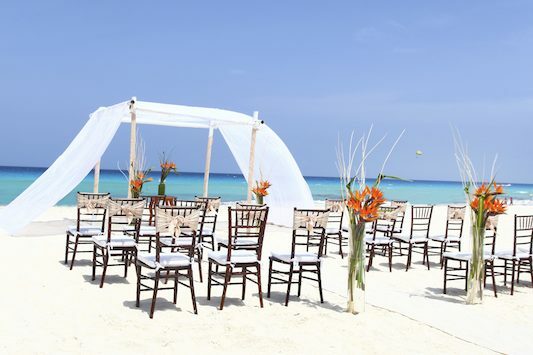 Sandos Cancun Luxury sits along one of the most magnificent resort areas in Cancun, perfect for a destination wedding, centered on land between the Nichupte Lagoon and the crystal Caribbean sea. Beyond the sweeping oceanic views, your wedding guests will find chic decor around every corner, and impeccable service will be on offer for a modern wedding ceremony. Wedding packages at Sandos are designed to make every little detail stress free; they even include a DJ with sound and lighting during your private dinner. For a unique moment to share with your wedding guests book a group cooking demo. Receptions hosted in the ballroom can party until 2am. Each package welcomes up to 30 guests. A la carte weddings and Indian wedding packages are also available. Upgraded packages, additional guests, and add-ons are available for an additional cost. 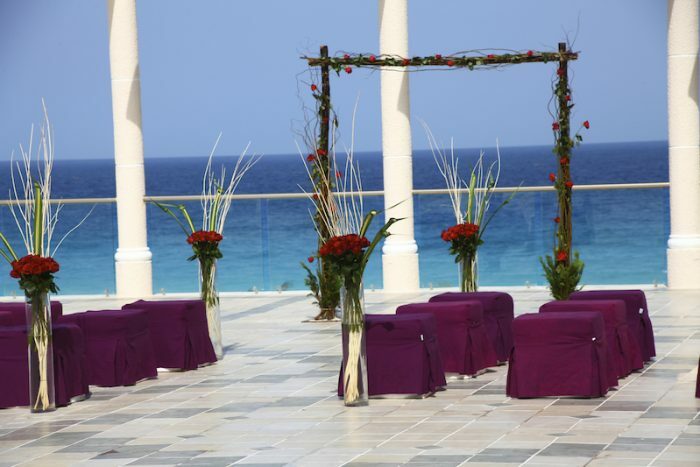 The resort is able to perform between 1 – 3 weddings per day but prefers to just host a single wedding per day. In case there are more than one weddings scheduled per day, they will take place at different times during the day and at different locations in order to guarantee privacy to each wedding. $160 – $220 average price per person per night. Rooms include free wifi and 24-hour room service, children 1 and younger stay free. There are 214 rooms with lagoon, ocean, and resort views. The property is suitable for all guests including those mobility impaired. The resort can accommodate kids happily but is geared towards adults. A: I have been coordinating weddings for 4 years. A: I have coordinated more than 250 weddings in my career. 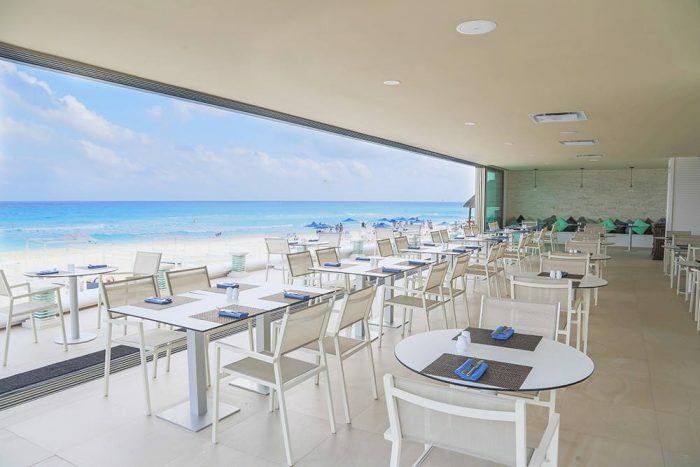 A: Sandos Cancun is an intimate and luxurious property in Cancun with only 214 rooms. 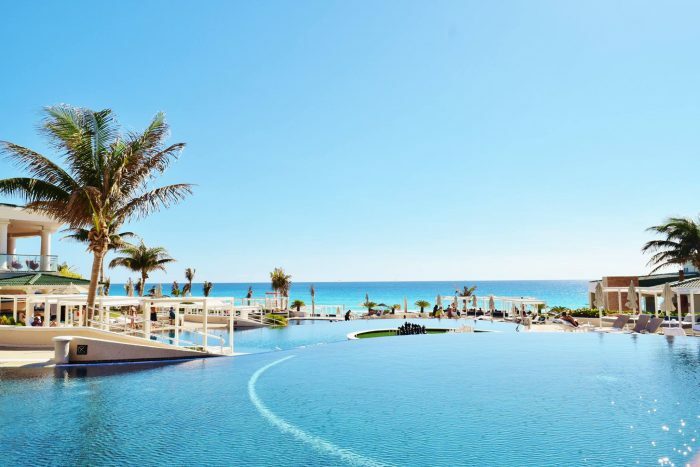 All the areas of the resort are nice and close together which makes it easy for your wedding group to meet up at the pools, bars, and restaurants. Being an adults-oriented property the resort has the chic vibe of an adults-only resort to it. But kids are allowed to stay and welcome, so you can definitely bring your little ones and have them be a part of this important event. 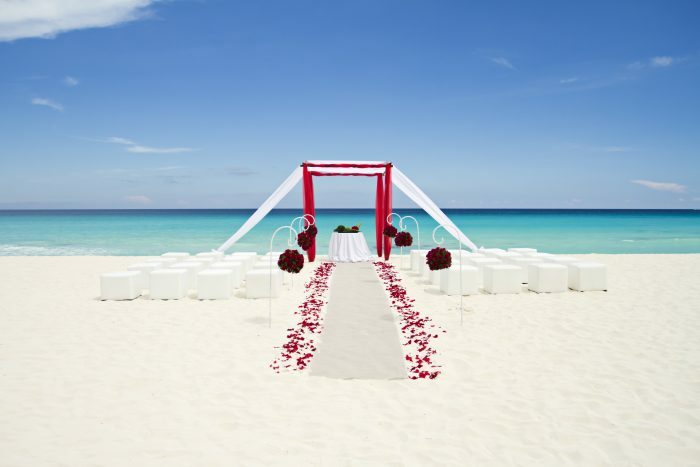 In Cancun the white powdery sand and the bright turquoise colors of the ocean are the most spectacular backdrop for your wedding pictures. The resort features several beautiful terraces (including our penthouse terrace on the top floor) where you can celebrate privately and in style with the beautiful ocean view but without being right on the sand. If you are looking for a great party, at Sandos Cancun we are able to offer receptions in our ballroom until 2am! A: We prefer to make one wedding per day so this can be tricky for securing a specific date. A: Giving the bride and groom and their invitees the opportunity to take back a little bit of the destination back with them (not literally) but with memories that will be remembered forever. A: While arranging a wedding a few years ago, the minister was a friend of the couple´s family. He was last arriving on the wedding day due to unknown circumstances. On this occasion, the minister did not arrive on time and keep in mind that the bride and parent wanted that their minister hold the ceremony because he had performed all the ceremonies for the family. So it had a very special and sentimental value for them. I had to get a hold of the minister by phone to see his location prior to sending somebody to pick him up to be brought to the wedding ASAP. Upon arriving at the property I had everything set up so he could change and had him go to the terrace as quickly as possible. Good thing I had a backup plan with another minister who started the ceremony and minutes after the family minister arrived and concluded the ceremony, so the bride´s family were very happy!